AC/DC 24 Volt Switchmode 24 watt miniature SMPS regulated power supply, with 24 volt DC output, 1000mA, 750mA, 500mA.
. More 24 volt power supplies click here. This is a compact, high quality, switchmode regulated power supply with stable output, up to 24 watts continuous. It has a fixed AC plug as shown. .Slimline wall-mount format for placing side-by-side mounting in a wall socket or power strip. Output Voltage: 24.0 Volts D.C. Overload Protection (OLP) Fully protected against output overload or short circuit. OLP is set at about 120-150% of the rated continous output. NOTES: (1) All measurements are at nominal input, full load, and +25°C unless otherwise specified. (2) Load regulation is measured at 230Vac or 120Vac in percentage to indicate the change in output voltage as the load is varied from half load to full load (±%). (3) The exact obtainable load regulation depends upon the output cord selected and load current. 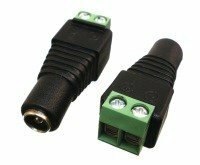 Optional DC Plugs slip over the 5.5 x 2.1 mm connector if desired. 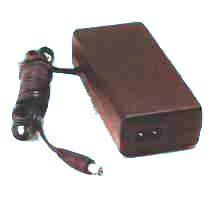 Universal input switchmode power supply with fixed 24 volt output voltage. 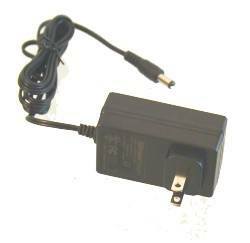 High efficiency miniature power supply for networking and telecom use.